A water cooled chiller system is generally the least expensive option for industrial fluid temperature control systems, while being space saving and efficient when a source of water is available for cooling the refrigeration system condenser. These water-cooled chiller systems can be designed as indoor or outdoor units; heat rejected by the refrigeration system goes to the building chiller or facilities water. Available extreme temperature stabilities of ±0.05°C for critical applications, even with high cooling power requirements up to 70kW, Mydax is bringing laboratory precision to the industrial market. If your application requires very low heat transfer fluid temperatures (below -40°C) our CryoDax Low Temp Chillers would be a great solution. If facilities water isn’t available, we suggest the use of an Air Cooled Chiller system. 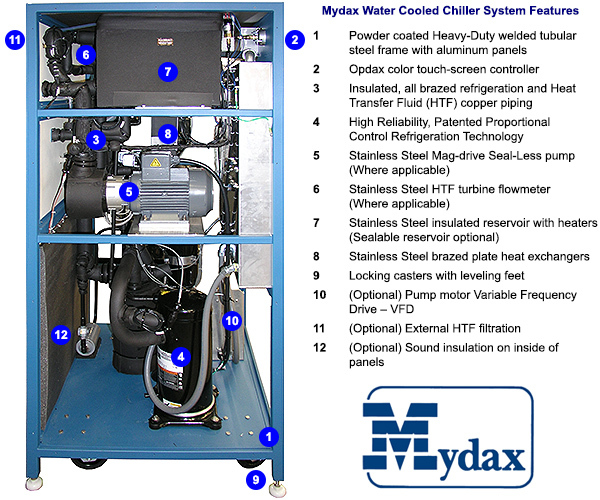 Liquid Chiller Systems in Mydax Quality Assurance QA Test. 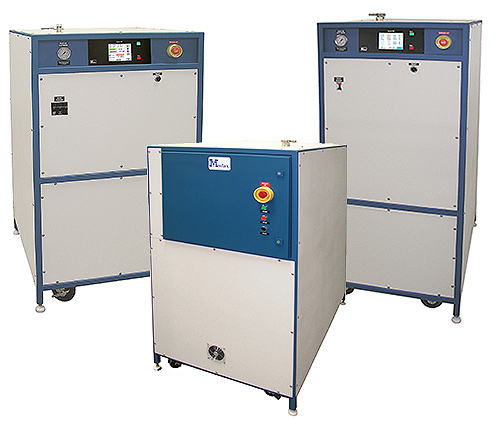 Three Loop and Single Loop Water Cooled Chillers.